"Though the vehicle emitted a soft brass glow, I could see my distinct shadow on its grooved, sloped surface...Whenever I took a few teps along the object's circumference and then stopped, my shadow took an extra step." 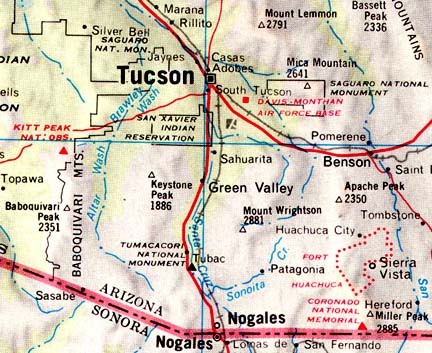 In the eastern city limits of Tucson, Arizona, is Davis Monthan AFB. Southeast is Fort Huachuca, long associated with underground facilities linked to monitoring, or interacting with, a non-human intelligence. June 14, 2007 Albuquerque, New Mexico - Recently I met an Albuquerque resident who has had high strangeness in his life since childhood. Now in his mid-fifties, W. Scott Frank is trying to make some sense of his odd experiences by writing them out for a book manuscript he hopes to publish one day. An especially haunting event that involved another intelligence's mind manipulation, mimicry and illusions occurred at the end of 1976 in Tucson, Arizona, when Scott was in his mid-twenties. Scott Frank gave me permission to reprint "By the Curve of the Tracks" as an Earthfiles Real X-File.